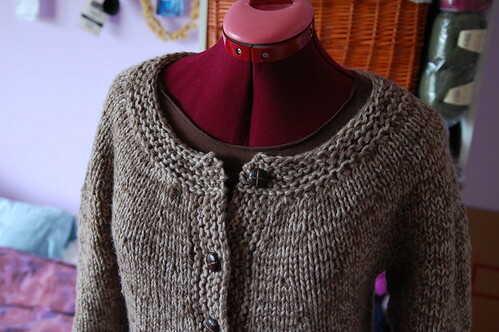 I was re-sewing the buttons onto this sweater when I realized I hadn’t blogged this one either! I finished this one a long time ago, sewed the buttons on rather shoddily (necessitating re-sewing them on!) and wore it a few times before we hit a warm spell. Judging by the weather today though, I might get a few more wears out of it! 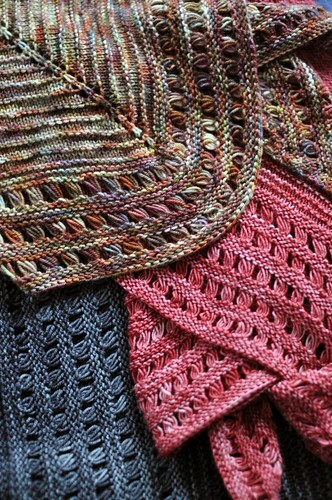 Pattern: my own design; hopefully forthcoming in the fall! This one is top-down, circular yoked. It went surprisingly fast considering the length, but the bulky gauge made for quick knitting! The front bands are short-rowed so that they’re wider in the skirt portion of the coat. It’s raining and cool again today, so maybe I’ll wear it out! I need to get to Ikea to buy a new desk chair :) Any recommendations? Socks that Rock Mediumweight in “rose quartz”. 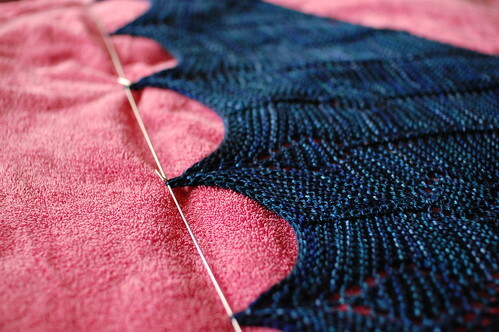 And I’ve got a new mini shawl pattern in the works! Mmmmm, deep blue Handmaiden Casbah. You know what? I think I finished this cardigan, stuck the photo up on Ravelry but neglected to post about it here! 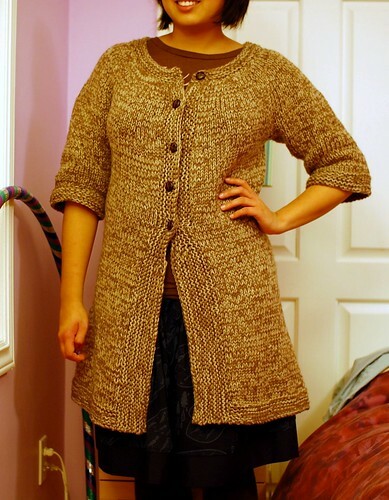 Notes: This is a bottom-up, circular yoked cardigan with lots of shaping and a round neck. 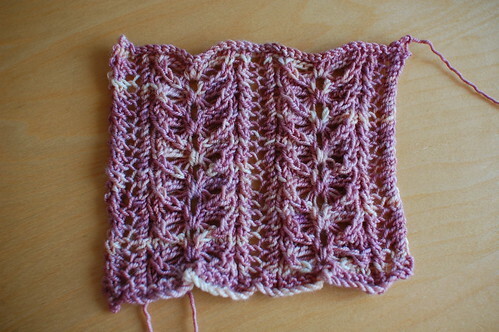 The knitting was pretty easy, although figuring out how to decrease for the yoke took a but of doing! 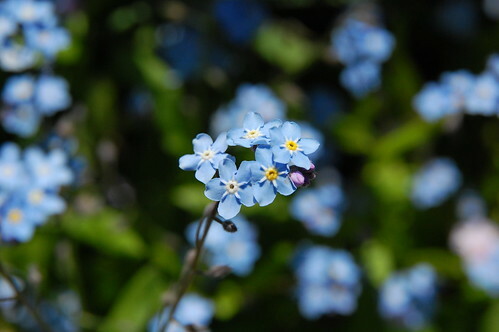 I’m working on the pattern now – it’s all written, but needs to be edited and formatted, and I need some new photos too! So I’m hoping to have it up in a few weeks. 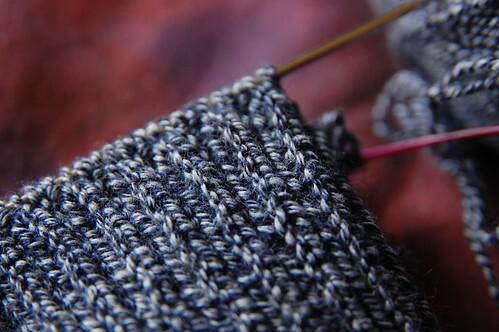 I’m almost done a new project that’s been on my needles for awhile but has been resisting completion – I’ve had to rip and reknit portions several times! I think I’m almost there though. 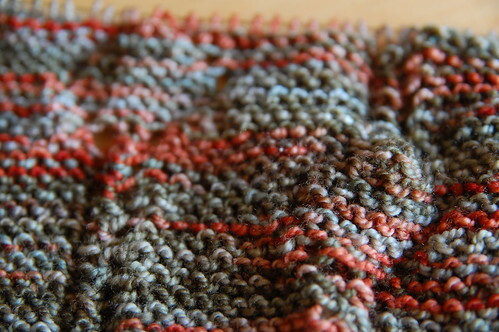 Koigu and garter stitch. Is there anything better? 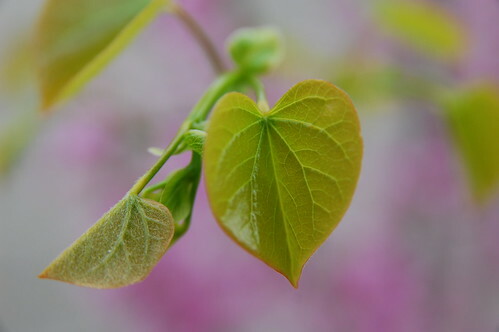 I’m completely enamoured of my new lens. To celebrate, some random photos! 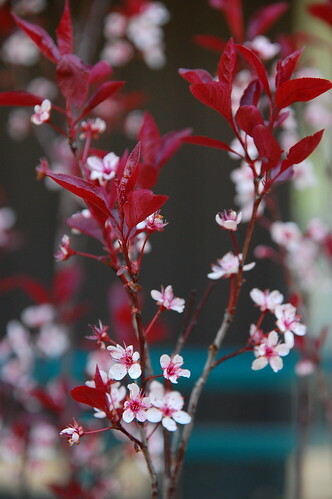 Mostly flowers, because, well, they make awesome subjects. I really need to practice with some yarn though! 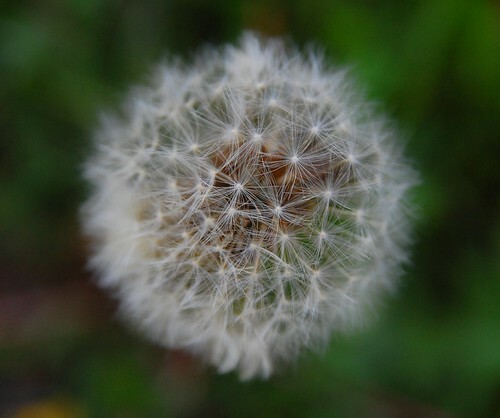 And my favourite of the day, a dandelion – the prettiest annoying weed there is. P.S. 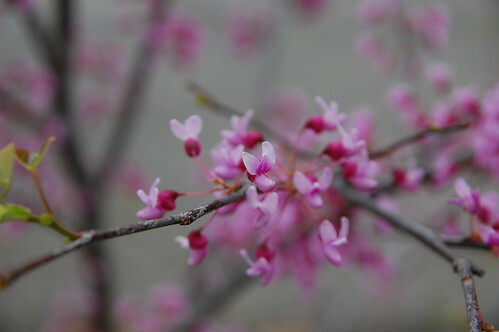 In case you missed it in the last post, the lens I got is a Sigma 17-70mm f2.8-4.5!